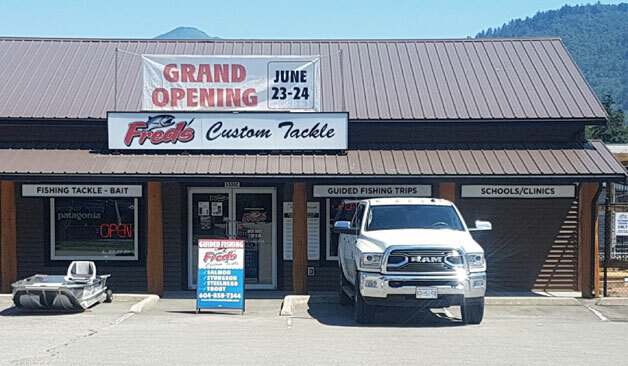 Fred Helmer and his team would like to invite everyone to celebrate the grand opening of Fred's Custom Tackle's Chilliwack store at 6336C Vedder Road, on June 23rd and 24th! During the grand opening, beside excellent deals to be had at the store, there will be many attractions. These include product demos by reps from a number of reputable brands which the store carries (Rapala, Gibbs Delta, Okuma, Shimano, Daiwa, Loop Tackle, Pure Fishing, Scientific Anglers, Islander Reels, Peetz Outdoors, Owner Hooks, Lamiglas, Simms, Humminbird, Scotty Fishing Products, Bent Rods). There will be a BBQ happening on both days, by donations only to Fraser River Sportfishing Alliance. Willie Holme from Loop Tackle will also be offering free fly casting seminars throughout the weekend! Beside lots of prizes and gift cards being given away, the grand prize will be a $500 gift card!